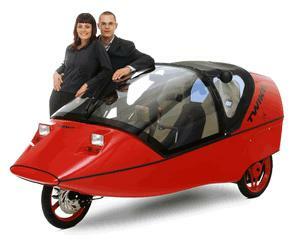 The Twike, Hybrid Vehicle with Pedals | OhGizmo! By David Ponce on 07/18/05 • Leave a comment! The title basically says it all. It’s yet another hippy happy hybrid, that’ll take you about 130 kilometers at a top speed of 85km/h. Like other hybrids, it regenerates some electricity from braking and can be recharged from any outlet (at 1km per minute, on a 230V outlet). Should you overshoot your travelling distance, and run out of juice midway, you’ll be able to pedal the rest of the way there. Googling around shows that this thing seems to be nothing new. That’s fine though. You know it’s fine, because not everyone knows everything. For instance, I don’t even know how much it costs, though I saw $17,000 and $20,000 tossed around here and there. That’s a loot of green for a 500lbs electric bicycle. Still. Check out a full review here and the Twike website. Story VIA Worldchanging.